This is my first recipe using Oreo biscuits.After i tried my one minute eggless microwave chocolate mug cake successfully, i kept hunting for some easy microwave cake recipes that can make wonders in few minutes.This is one such recipe &I got it from here.All you need is just 3 major ingredients and 5 minutes.Your cake is done,Cool right ? .The highlight is,its butterless,eggless,no oil and no curd too.Oreo biscuits & Eno fruit salt will do the magic here.Even your kids can do it by themselves and i am sure they will enjoy both the cooking process as well as its taste.You can very well replace Oreo biscuit with bourbon or hide n seek biscuits and Eno with baking powder.I won’t say this cake will double while cooking OR it comes out super soft.It does rise & comes out soft & not as the ones u bake in convection mode.But this recipe really made wonders in few minutes i should say! Last year i shared a fool proof, Eggless,no oil, no butter Orange biscuit cake recipe using convection microwave oven.Do check it if interested.Friends,Go ahead and try this cake now.Surprise your kids while they come back from the school . 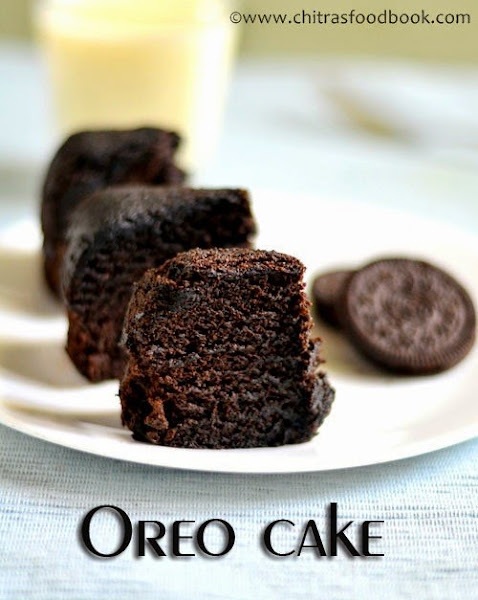 Microwave oreo biscuit cake recipe in just 5 minutes - There is no oil,no butter & no egg !! In a big mixie jar,take all the biscuits with cream & sugar.Grind it coarsely.Now add milk & Eno.Grind to a smooth paste. Grease a microwave safe bowl with butter or oil generously(I used oil for greasing the pan and the cake got a shine as u see in the first picture, in stepwise i shown the one in which i used butter paper for lining.) OR line the bowl with parchment paper or butter paper. Pour the cake batter to the bowl.Batter should fall like a ribbon.It should not be too watery or too thick. Pat the bowl in the bottom to spread the batter evenly. Microwave it in high power ( i used 800W) for 3-5 minutes.Check at 3 minutes.If not done,keep it for more time.Mine took 4 minutes.Check it with the back of spoon or tooth pick.If it comes out clean,cake is done.Else keep it for one more minute.Cake will rise but wont double.Remove & keep it outside.Let it cool down.Then invert the cake,cut into pieces and enjoy ! If u try to remove the cake before it cools down,cake will crack.If u use butter paper,u can remove it easily. You can use either butter paper or grease with oil.But when u use oil,u should wait till the cake cools down completely &the upper part of cake will get a shine as u see in the picture.U won’t get this shine if u use butter paper. U can decorate this cake by sprinkling some icing sugar on top OR apply Instant whipped cream over it. I kept a edible sugar flower. For variations,u can use bourbon OR hide n seek biscuits too.Adjust the quantity of sugar as per your taste. Add plain ENO salt ( blue colored sachet) OR 3/4 tsp of baking powder. Use a butter paper or grease the bowl with butter for easy removal of cake. Do check out my One minute eggless mug cake and Orange biscuit cake recipes too ! Wow going to try for this weekend Chitra.. my kids would love it for sure! wow!! thats a quick and yummy cake!! I must have to bake it to stop my chocolate cravings now. Wow too easy cake ..Def a must try recipe ,At least for my daughter . wow...this sounds so easy and delicious...lovely oreo treat, beautiful clicks Chitra! will try it for sure! Hi,so easy cake with little ingredient s,great ya,c the piece u r showing me,so good. Cake looks so soft and delicious and easy too, have to try this..
hi ,it looks easy & tasty. 20 nos means, please clarify? Thank u chitra for d speedy dr speedy reply.I baked in d otg but I think milk qnty shd be reduced coz d batter consistency is just right for microwave oven. For otg it has to be slightly thick.cld u pl list d ingredients measurement for otg oven pl. My cake was gd n texture was also gud I added more biscuits cause d batter was runny n added a little more eno.. I very much liked d texture of yr cake. Can it be tried wid Marie biscuit wid same proportion. Hi Chitra I appreciate yr promptness . I baked at 180 degrees c. For abt 25 to 30 mts. Oven timings are subjective so we need to set as per our oven timings. My mother is so happy as I made this cake for her on Mother's Day (today). The texture of this cake is soft.If u want more soft,add little more Eno & milk.Cooking time may vary. Hi,please bake for one more minute.check with a toothpick and then remove.U will get it right.I think the quantity of milk may be more.so it happened. Sorry.iam not sure y but i guess it may b due to over baking or did u keep the cake in the bowl for long time.the heat of bowl woukd have made the cake hard. Hi i tried this recipe n it came out very yummy! !..everyone loved it..wat if i use strawberry flavoured oreo biscuits? Hi,Thanks for the feedback. Yes,u can very well use strawberry or any flavored biscuits.Only the taste & flavor may vary :) But the texture of the cake remains the same ! i had tried 100 times in my life... awesome taste..
Oreo or baking powder both are added? Thank you for the nice n easy recipe. It came out as you've described. This one is a keeper recipe. I tried ur 5min eggless Oreo biscuit cake.it was just looking awesome.taste also gud.but only problem was it's edges were very hard.. I tried ur Oreo biscuit cake. It looked exactly like your cake.taste also nice. But problem was it's edges became very hard after 10 min. Where was the mistake? I kept it in microwave for 5min after its baked.I didn't take it out immediately. Yes, the same. Buy the blue packet, plain one. Oreo biscuits have cream. So no need to remove it. Hi, im absolutely love this idea. and going to make this ASAP. btw can i steam it? Thanks. I am not sure of steaming it. Try in microwave. @unknown, Temperature might be high or over baking. Reduce the time and keep in 800w power next time. Nice blog thanks for your post! got an nice idea how to make a coke with the help of Oreo...Kepp Blogging!!!! Yes, you can try I think. I haven't attempted so far. Consistency should be like falling ribbon.No need to add more milk I guess. If needed, u can add 1 tsp extra. Try cooking for 10 to 15 minutes, check with a toothpick. If not done, cook for another 5 minutes. Hi Chitra, I have convection microwave oven.. How do I set to 800w.can u pls let me know wat shud be the temperature and timings to bake. Hi, In your oven, press microwave button till it comes to 800w. If you press, temperature will increase. Then you should press the time button and set to 5 minutes.